Kaycee Moore (left) on working with Charles Burnett: "He was quiet, he had a calming aura about him, he was pleasant. He didn’t get excited easily. He never got upset with me easily, which is saying a lot because people get upset with me easily ... I like a director who is patient or a director who will shout at me, really give it to me so I can do something with it. I don’t go for those bland oatmeal directors, not too hot, not too cold. Charles was good." Critic Terrence Rafferty of GQ called Killer of Sheep "one of the most striking debuts in movie history." In this episode of The Drunk Projectionist film podcast, I interview Charles Burnett, writer/director of this important — and visually stunning — film. Killer of Sheep examines the black Los Angeles ghetto of Watts in the mid-1970s through the eyes of Stan, a sensitive dreamer who is growing detached and numb from the psychic toll of working at a slaughterhouse. Frustrated by money problems, he finds respite in moments of simple beauty: the warmth of a teacup against his cheek, slow dancing with his wife, holding his daughter. The film offers no solutions; it merely presents life — sometimes hauntingly bleak, sometimes filled with transcendent joy and gentle humor. The film was shot in roughly a year of weekends on a budget of less than $10,000, paid for partially by a $3,000 grant, and also out of the pocket of Burnett himself. Shot on location, the film offers an episodic narrative with gritty documentary-style cinematography. • Born in Vicksburg, Mississippi in 1943 and moved to Los Angeles with his family at an early age. • Attended John C. Freemont High School in Los Angeles and the University of California - Los Angeles (UCLA). • Killer of Sheep won the critic's prize at the 1981 Berlin Film Festival and was named to the U.S. Library of Congress' National Film Registry in 1990. • According to Sally Hubbard, who wrote the program notes to the film at the 10th Festival of Preservation, "Killer of Sheep was almost impossible to see for many years, and was available only on poor quality 16mm prints. This 35mm restoration was made from the deteriorated original 16mm negative, and 16mm and 35mm soundtracks." • Other Burnett films include My Brother’s Wedding (1984), To Sleep with Anger (1990) starring Danny Glover and The Glass Shield (1994), starring Michael Boatman, Ice Cube and Elliott Gould. • Awarded an honorary Academy Award at the 2017 Governors Awards in the Ray Dolby Ballroom at Hollywood & Highland in Hollywood, California. "Every time I see it," Charles Burnett says of this image, "I cringe." When filming Killer of Sheep, Burnett didn't think of what might have happened had one of the kids who jumped between the buildings didn't make it. "It's a gap of three or four feet," he says in the podcast. "At the time I was doing it, it never occurred to me what would happen if those kids fell. The fact of the matter is they did it all the time ... but I shouldn't have allowed it to happen." 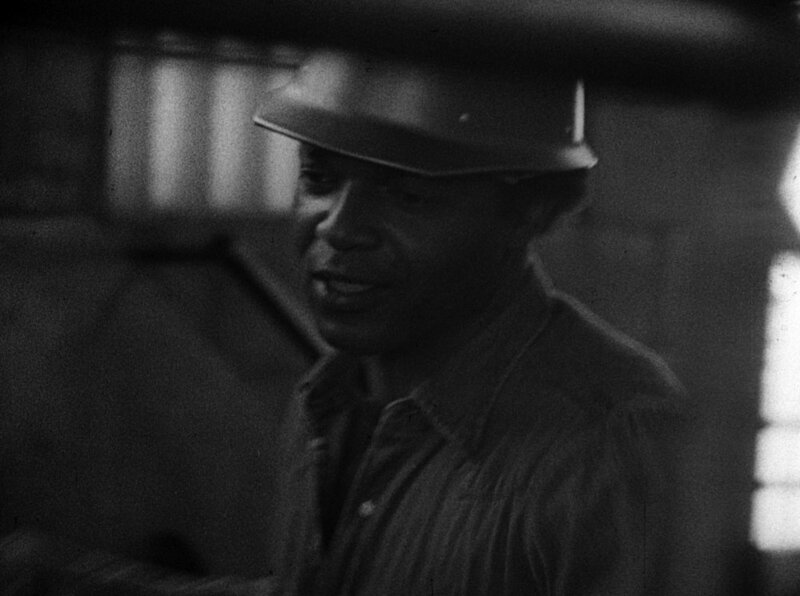 Henry Gayle Sanders (above) on shooting the slaughterhouse scenes: "I remember Charles and I driving in his Volkswagen to San Francisco, and outside of San Francisco [in Solano] there’s a slaughterhouse, which is where we shot. The day we got there, we were planning to shoot but it was closed so the two of us go to this dinky hotel and first thing in the morning we go into shoot. It was only me and Charles so I remember I was doing everything, the clapboard, light readings ... and the sheep were there and we didn’t actually kill any of them but the sheep were herded into a room and I was whacking these sheep in the back of the head with this stun gun and there’s a conveyor belt with hooks that pulls them up by the leg like you see in the movie with the sheep hanging upside down. It was ... well, I used to be a pretty big lamb eater and now I don’t eat lamb."